Is Spinning Allowed In Foosball? When it comes to game tables for your game room, there are a few options at your disposal. You have pool tables, which are ideal for those who are skilled at the game, but not so much for those who are not. There is also air hockey, which is a little more forgiving than pool, but the maintenance of the tables is always a pain. Of course, you can opt for table tennis, which is always fun as long as you don’t lose the balls. If you purchase a pack of fifty ping-pong balls with your table, you will likely not run out anytime soon, but your floor will also be covered in traps, just waiting for you to step on them and tumble. So what is the ideal game table that you can invest in if you don’t want to deal with all of these issues? Of course, we think that foosball tables are the best option thanks to their perfect mix of convenience and fun. It is rare to lose a ball with a foosball table, and there is less of a skill gap in between players. When playing foosball with teams, you don’t have to worry as much about the difference between the quality of players as you would when playing table tennis or pool. This does not mean that foosball requires less skill, but we believe that it is a little more forgiving than the other games. 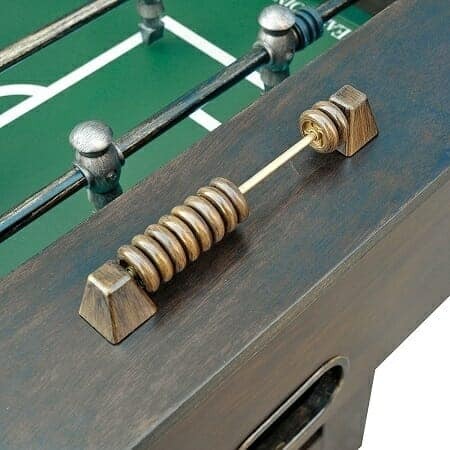 Unfortunately, finding an affordable foosball table can often be a challenge, so that is where we come into the equation. Today, we are going to be reviewing one of the best foosball tables that you will come across in the 500 dollar price range. In our review of the EastPoint Sports Durango table, we are going to take a look at each aspect in turn. Before we get to our review, we will be going over two points that are integral to purchasing the best foosball table possible. As with any game table, the vast majority of foosball tables will have to be assembled when they arrive at your home. The easier it is to put your foosball table together, the sooner that you will be able to play, so you may wish to opt for a table that features a streamlined assembly process. Some foosball tables will be so challenging to assemble that you may end up damaging the components when putting them together, so you will want one that is at least reasonable. The quality of the instruction manual that comes included with a foosball table can also help immensely. Foosball tables will see a lot of abuse over the years, so you will want to ensure that you choose a model that is at least reasonably durable. If you and your friends tend to get pretty excited over foosball games, you will not want the table to collapse because of some over-enthusiastic players. Of course, foosball tables that feature superior build quality will typically be more expensive than other options. Opting for a foosball table that is pricier but will last you longer is often the more economical choice in the long run, however. 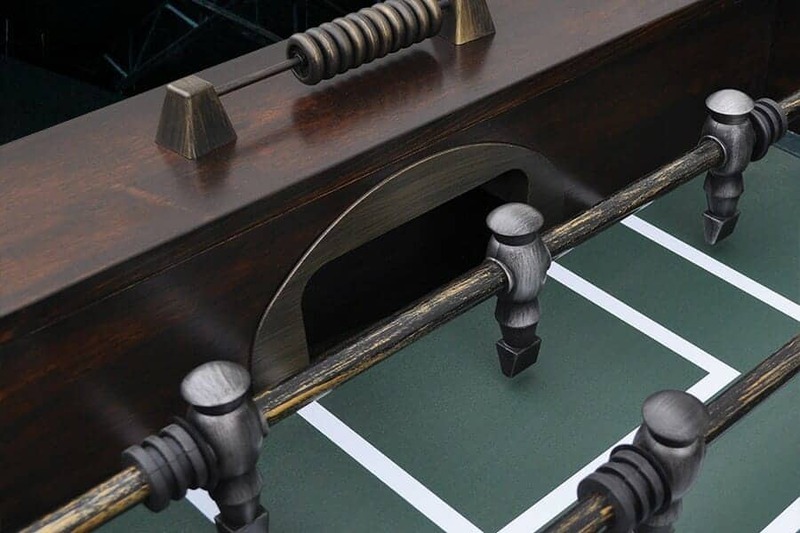 If you are in the market for the classiest foosball table around, we would argue that this model from EastPoint Sports is one of the best options. 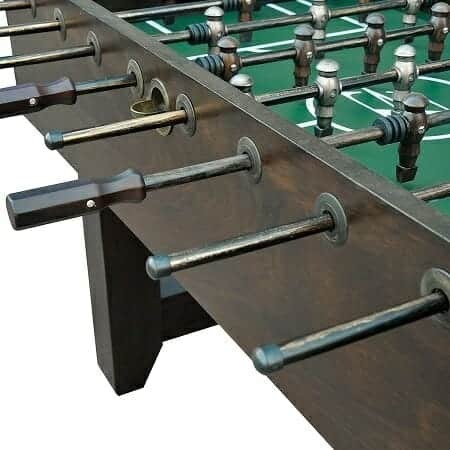 This is a mid-range foosball table that features all of the same features that you would expect to find present on a model that is worth twice as much. We were highly impressed by this foosball table for several reasons. First off, the wooden handles are much more comfortable than you would expect thanks to their ergonomic design. While some players may be wary of wood handles, these are just as comfortable as the handles on any other table. Since this foosball table is an official, competition-size model, you will be able to enjoy some intense games on it. The corners do not feature ramps, so this table has a three-man goalie setup to ensure that the ball does not end up getting stuck. The handles on this table rotate as smoothly as you would expect, provided that you oil them sufficiently, and the players are balanced and weighted. If you are looking for a foosball table that plays well but isn’t flashy, there are few options better than this one. We also went over customer reviews and testimonials so that we could get a better idea of how this product was received. 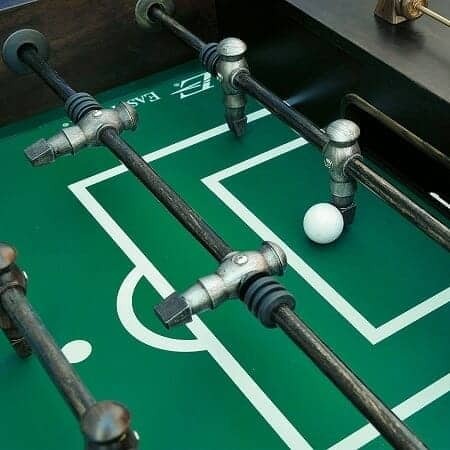 Most buyers were impressed by the excellent value for money that you get out of this foosball table, as it is essentially a professional table for around half the price. Customers also praised the inclusion of two balls with this table, ensuring that one is available even if the other is lost. When it comes to negatives, there were some complaints about the assembly of this foosball table, though the instructions were helpful in overcoming any difficulties. Some customers report that the wood grain panels are not as durable as they would have hoped. 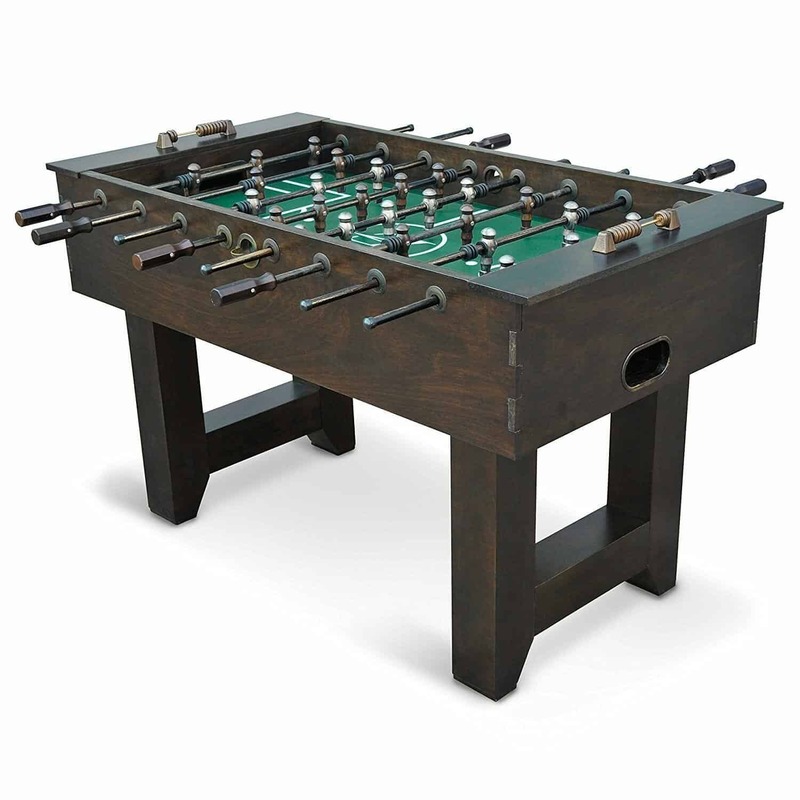 We have already mentioned that this product has an average price when compared to other foosball tables. You can typically find this product available for around 500 dollars, but it can drop to as low as 425 when it is discounted. When on sale, this product is one of the best deals we have seen. The EastPoint Sports Durango table is one of the best options for customers who want immense value for money in their new foosball table. We hope that this review has helped you decide on the best foosball table for your needs.